A kit of counting chambers 195 € + VAT. Prices over 25% cheaper than the other equivalent products. Lower prices are achieved through flexible production and the very plain collection, where excessive quality is ditched in favor of specializing in the practical matters of the product. Client pays the shipping costs. More information by email or telephone. One kit = a counting chambers (contains a bottom glass) + a cylinder + a cylinder cover glass + a cuvette cover glass and a package of bottom glasses (100 pcs). 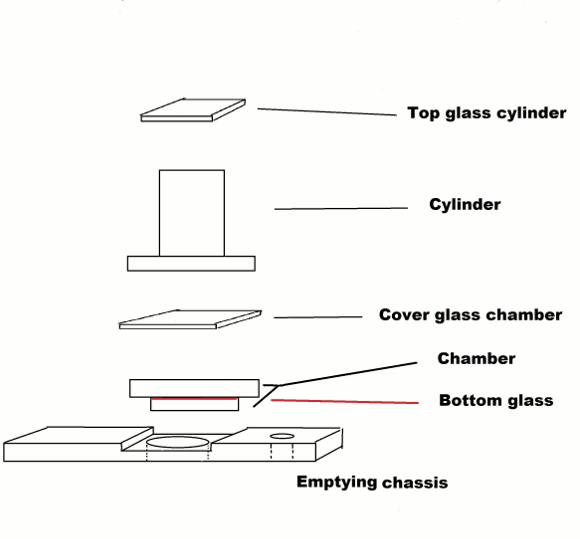 A cylinder comes with 1 cover glass, and a cuvette with 1 cover glass and 1 bottom glass. More glasses can be ordered separately.